Jerry Baker has been riding in the Northwest since the roads were dirt, back when shorts were wool, chamois were leather, and you switched gears by removing the wheel and flipping it around. And the Marymoor Velodrome. Some of the first racing kits worn around here were bought from JB and what sad news this is. RIP Jerry. 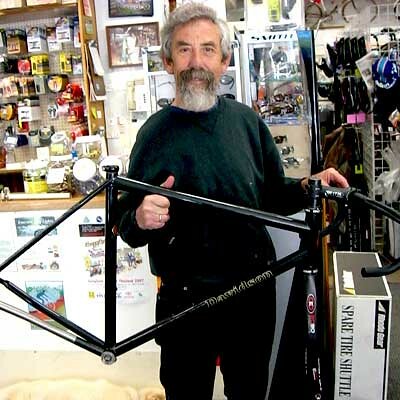 After writing this post, Robert Freeman, former co-owner of Elliot Bay Bicycles share this obituary. Jerry Baker passed away this morning of Acute Myelogenous Leukemia. He had been on holiday in Pennsylvania when he got sick. It progressed very rapidly and he only lasted a few days. Jerry was an icon in Seattle cycling circles. He ran Baker’s Bikes in the 60s and 70s, out of his house. A small but high quality racing shop. He sold frames from Davidson, Hugh Porter, Holdsworth, and others, and built wheels and complete bikes. Then in 1980 he started Baleno, a small wholesale company that had Santini clothing, Rivat shoes, ProTec helmets, and other goods. After that he made custom clothing and was a fabric importer. Jerry was instrumental in getting the Marymoor velodrome in Redmond built in 1972 and rarely missed a night of racing there all these years. Jerry was one of three people who helped organize the first Seattle to Portland race/ride, in 1979, and had the fastest time that year, (beating Dave Shaw and me by 6 minutes). He always claimed to be the only person to have ridden every STP, though freely admits one year it was Seattle to Puyallup. He was a warm, funny person with a heart of gold, and generous to a fault. He will be greatly missed by many people.